(Nanowerk News) For three decades, astronomers thought that only Saturn's moon Janus confined the planet's A ring - the largest and farthest of the visible rings. But after poring over NASA's Cassini mission data, Cornell astronomers now conclude that the teamwork of seven moons keeps this ring corralled. Without forces to hold the A ring in check, the ring would keep spreading out and ultimately disappear. 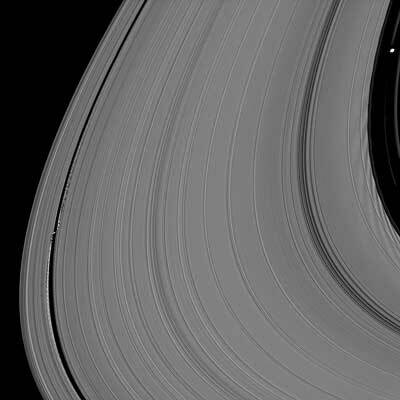 "Cassini provided detail on the mass of Saturn's moons and the physical characteristics of the rings, so mathematically speaking, we concluded that the moon Janus alone cannot keep the rings from spreading out," said Radwan Tajeddine, a research associate in astronomy and lead author of the new research. “What Confines the Rings of Saturn?” is planned for publication Oct. 18 in the Astrophysical Journal. Tajeddine also will present this research in a poster at the American Astronomical Society’s Division of Planetary Science meeting Oct. 17 in Provo, Utah.